After enjoying the first book in the series (here) I was raring to go with the next – though slightly trepidacious as those self same twitter buds that introduced me to the books were not as fond of this one. Its always tricky when you know a little *too* much about your next read! This book picks up a few months after the first one ends. Katniss is trying to settle back into her life. While the first book in the series focuses almost exclusively on the Games themselves with only tantalising glimpses of the places and society outside it’s artificial and ever changing boundaries; this story elaborates on the world outside the arena. Fundamentally; this is a book with two distinct and very different halves. The first focuses on Panem and how it is run. The second presents Katniss back in the Games. Katniss and Peeta are finally home – where nothing is as it was before. While they live in luxury – their families safe and provided for – everyone around them continues to live in desperate poverty, eking out a living and hoping against hope that they are not the next tributes plucked for the Games. Both of our protagonists are more isolated than ever. Peeta is heartbroken after Katniss reveals that her affection for him was manufactured for the cameras (though in her heart of hearts, she’s not entirely sure that’s totally true. He cuts her off completely when they are not on show for the Capital; making his romantic façade all the more painful to read. However it’s not like Katniss can turn to Gale, who has suddenly started seeing her as a young woman and viable partner. He kisses her but is ultimately too caught up in trying to provide and protect his family to progress to anything more. Aware of the risks of the all-seeing eye (less Sauren ‘in the sky’, more Big Brother style cameras all over the place); Gale hints towards revolution, resulting in Katniss feeling less secure with him than she had remembered. Far more worryingly; Katniss has made an enemy of President Snow – a truly terrifying character, simultaneously smelling of blood and roses. He blames Katniss for the growing unrest and uprising in the districts, viewing her act of defiance in the arena (saving Peeta) as the catalyst. Snow also reveals video footage of Gale kissing her and warns Katniss that he will destroy her; turn the public against her; torture her family and kill her friends if she does not demonstrate with utter conviction that she acted in the Games out of pure love for Peeta and not to spite the rule of law. The first stop on their obligatory tour is District 11 – the home of Rue – Katniss’ ally in the previous book. Despite their best intentions, both Peeta and Katniss overstep their bounds. As a result, they see the local population punished in a brutal fashion. Haymitch warns them that everything that happens on this tour will be scrutinised. Once again Peeta and Katniss are working together. Once again their lives are at stake. Falling into their prescribed roles, the pair continue on their visit of the country. Each district is different yet worryingly tense. As in book one; the districts closest economically and financially to the Capital seem most content with the status quo. The poorer ones seem to be unifying under the banner of the Mockinjay – a sign that Katniss is only vaguely aware of but that she recognises as a worrying link to her Games. There is also a rumour up and down the country – that District 13 – believed destroyed after leading the revolt that started the Games – still exists and is the headquarters of the revolution. By the time they return to District 12, Peeta and Katniss have a working truce. They are also – publicly anyway – engaged to be married. Conditions have worsened for their district. At this point the book shifts a gear, describing the Games. This section is so involved; I’ll just touch on the major points. After a few months of playing the dutiful bride to be; Katniss and Peeta are shocked to be recalled to a special 75th anniversary of the Games – in the midst of preparing for their upcoming wedding. Not only are they to have to run the risk of the Games again, every previous victor is required to compete – including Haymitch – their mentor and strategist. This time round Katniss knows that she will not be able to save Peeta by herself. She begs Haymitch to work with her to ensure that Peeta survives – blindly refusing to see how unlikely it would come down to just the three of them. The situation is further complicated by the anger and sense of betrayal across the districts. Every victor of the Games had won the right to life, guaranteed by the Capital. Losing this status reflect badly on the integrity of the state as a whole. Pushed beyond their limits, Katniss and Peeta refuse to tow the line during the pre-Game trials and public demonstrations. They each demonstrate their willingness to work together despite the clear intention of the Games to pit them against one another. They are allocated the highest risk assessment of any competitors. Within the surviving victors they do find a certain kinship. Every previous winner knows the game being played. Rather than the antagonism of the first Games, these competitors deliberately support one another against the brutality of their shared situation. Cinna and the rest of the team work behind the scenes to ensure that the full romance, nobility and tragedy of Katniss’ situation can be seen across Panem. Indeed the last thing that Katniss sees before the Games begin is Cinna being tortured for his actions. During the final interviews, one by one each of the tributes – with various degrees of subtlety speak out against the Games and the system behind them. Except for Peeta. He charms the crowd, then announces that he and Katniss had married in secret and she was pregnant. The crowd goes wild, but with unease, rather than bloodthirsty satisfaction. Peeta had just ensured that Katniss was the favourite of the masses. The Games themselves are rather rushed, with almost too much happening too quickly. The tributes are in the main indistinguishable. Only the ones that you rapidly realise will work with Peeta, Katniss and Haymitch are described in any sort of detail. Working together, a rapidly dwindling band of tributes work out how to defeat the game structure. In the end, they manage to break through the barrier and Katniss is knocked out. When she comes to, her life has changed again. She is being taken to District 13. She has unwittingly become the symbol of a revolution. Gale is an active participant. She is alone again. Peeta, always working to protect her, was taken prisoner by the Game Keepers. Katniss realises that he will be taken to President Snow and brutally punished. I enjoyed this book *almost* as much as the first. The Games are less detailed, if more nuanced but this was right and necessary to avoid repetition with the first book. I think that the characterisation was much better in this offering. Katniss in particular lifts off the page. 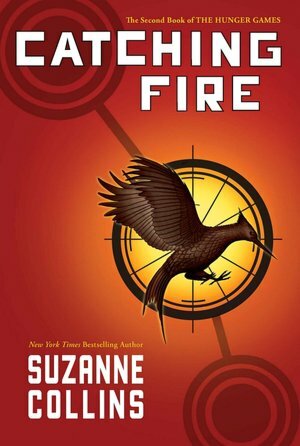 However, characters like Cinna – crying out for more – provided the bread and butter of this book. The people feel real. I can’t describe it better than that. However, it sets the scene too neatly. While you are dying to find read the final book, you are also conscious of the manipulation. Not the ideal. Still – I LOVED it. And immediately started the next one! Find the second trailer to the film here! ‹ PreviousNational Libraries Day 2012!